How to easily separate and cure salmon roe in a dashi brine to make ikura (Japanese salmon caviar). Unlike the limp salty goop that that comes out of jars, homemade ikura is truly sublime. The plump silken pearls of caviar glow like precious gemstones. Stick a spoonful in your mouth and each orb bursts with a satisfying pop, sending their rich, savory contents flooding over your sweet, salt and umami taste receptors in a wave of culinary bliss. I’ve put together a little video to show you how to separate the roe from the skein and this technique should work with almost any salmon or trout roe. Just be sure to select a skein of roe with large mature pearls. Immature roe have weaker sacs which will break as you try and separate them from the skein. Make the brine by adding the dashi, soy sauce, sake, sugar and salt to a bowl and stirring until the salt and sugar are completely dissolved. Watch the video for instructions on separating the pearls of caviar from the skein. Rinse the caviar with cold water and then put it in a container with enough brine to cover it. Save any remaining brine to use as an all-purpose seasoning or for another batch of ikura. The ikura will be ready to eat in 1 day. Hi Grey, thanks for the heads up and sorry about that. It’s fixed now. I absolutely love ikura or tarako with a nice big bowl of steaming gohan. All that I would need to complete that meal would be a side bowl of miso soup. Mark – I live in NYC. Where do you recommend getting skein of salmon roe? Hi Ann, unfortunately if you don’t live in an area where salmon is caught it’s unlikely you’ll see it in markets as the roe doesn’t keep very long. I think I’ve seen it at Mitsuwa (in Edgewater, NJ) before, but I’d call them before making a trip out. Oh man, I’ve been seeing sacks of roe lately and had no idea how to prepare them… now I’m excited to try this out! Thanks! Edit: Do these keep well? If so, for how long, and would draining the roe after the one-day soak be a good idea? Good news – I found the salmon skein at Mitsuwa. It was the last one (maybe the only one) left! Followed your directions and it turned out fantastic! Thanks much! This should be consumed within a few days after making. If you don’t think you can eat it all you can drain and freeze it. Hi Marc. Greetings from Brazil. Is it possible to do the same with flying fish eggs? We can’t find salmon roe here but have plenty of tobiko. Or do you happen to have a recipe for that? Congratulations for your awesome site! Hi Eduardo, first I have to tell you I’m a little jealous. I’ve never seen uncured flying fish eggs around here. That’s also why I’ve never cured them before and am not sure what the process is for separating the eggs (I don’t think the technique for separating salmon roe will work). As for the curing, you should be able to use the same brine to cure the flying fish roe through you may have a difficult time straining the small eggs from the brine once it’s done. If you try it, let us know how it goes. We get them frozen but unseasoned. They look like very bright, translucent pale yellow globules. It does not need to be strained as they come without the sac. I will use your recipe to cure and season it and I’ll post it later. Thanks a lot again. That is how it came out. The first pic shows unseasoned (left) and seasoned tobiko (right). I used it to test a tobiko jelly sushi made with kanten. Thanks again for your awesome site! awesome blog, but can you sub mirin for sugar? so far this was the most concise step-by-step and the video was great. Some excellent roe is up in Canada for $6/lb! Thanks Andrew! 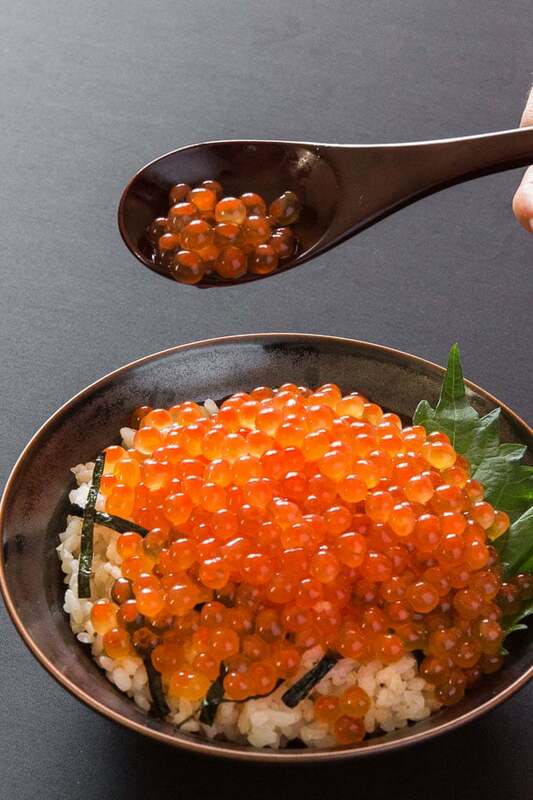 You could, but you’ll want to use real mirin (not the kind with corn syrup and flavorings in it) and you may want to cut back on the sake otherwise your ikura may end up a bit alcoholic. How do I make whitefish or sheefish caviar. And how do I preserve them like the ones which come in a jar from the store. I don’t have reliable refrigeration as we use solar power. Is it possible to use something other than sake? I don’t have any one hand and don’t think I need an entire bottle! Thanks. Hi Jenny, the purpose of the sake is to provide umami without introducing other tastes. Using other wines and spirits will alter the flavor, so I’d recommend using water if you don’t want to get a bottle of sake. Hi Tais, the ikura continues to get plump for about 2 days after soaking. It’s best to keep it soaked until it reaches its maximum plumpness, which gives each pearl a firm texture that pops when bite into it. At this point it’s best to strain in as soaking it longer will cause the skins to get tough. This is probably going to be a lot less salty than you’re used to. Hope you enjoy it! Interesting about the Russian word. It’s actually possible that the Japanese Ikura comes from the Russian word as the word is written in katakana (usually used for foreign words), and it’s a specialty of Hokkaido (the northernmost part of Japan). With the Russian recipe it doesn’t come out as salty because you only brine it for 5 minutes 😉 try it some times. They’re pearly and bursting as always. The dashi brine when you added it to the roe looks a lot lighter than what you prepared on camera. Did you dilute it? Nice catch, the correct color is the darker color. The video was done over a couple takes as I didn’t have the right type of soy sauce when I made the first brine, so I ended up using white soy sauce. You should use regular dark colored soy sauce for this as it has more flavor. One could use less salt and low sodium soy sauce [it’s basically salt with add. salt!] will help it become less salty in taste. Don’t really need the salt itself since soy sauce has salt in it. Not everyone can handle the salt esp. those on a relatively restricted diet and those with relatively high blood pressure. Also, it doesn’t need to be cured that long either, so every little thing to reduce the sodium content is good as not everyone can stand the relatively high sodium taste. As far as ikura goes, this is a relatively low sodium recipe (most recipes call far more salt). The salt is in there because the soy sauce is diluted with dashi stock (it’s not pure soy sauce). Also the whole point of curing roe is to preserve it using salt, so if it does not have enough salt it will not last. Lastly if someone has high blood pressure they should not be eating ikura. Hi Marc, I try your Ikura recipe and the taste is wonderful but I keep the soaking for 22 hours and turn out it’s already plump ?. Do you have any suggestion what to do now? it’s getting tired to bite since the egg is running around in my mouth ? Hi Ivonne, they will continue to get more plump until 2 days, which usually makes them easier to eat. But if you want to remove the liquid now, just dump them in a strainer set over a bowl and leave it in the refrigerator for an hour to drain. How long will the ikura keep? Does our have to be refrigerated or is the brine liquid sufficient? Hi Elizabeth, ikura definitely needs to be refrigerated and this should be eaten within a few days as the brine is relatively low in salt. If you make a more concentrated brine the ikura will keep a bit longer (maybe a week or so), but it’s be to either eat this right away or freeze it. Do you know of any online sources for ordering a skein of salmon roe? Hi Terri, sorry I don’t know of any places online, you may have a tough time finding it online because it’s easily perishable before it is cured, so it needs to be used almost as soon as it comes out of the salmon.